www.swivl.com • Retail Price: Swivl Robot + free Swivl Cloud subscription, $299. Optional bundles: Swivl Robot + 1 yr. Basic Swivl Cloud subscription, $499 or Swivl Robot plus 1 yr. Pro Swivl Cloud subscription, $799. Swivl is a video learning platform—an inexpensive mobile accessory, cloud hosting service, and mobile app—that enables users to capture and share videos from anywhere at any time. Swivl allows users to utilize a variety of technology, such as tablets and smartphones, to create multimedia videos. Users can then share this content on Swivl’s private and secure video hosting service, where they always retain the rights to their content. Quality and Effectiveness: The Swivl Robot/Swivl Cloud platform is designed to make lesson capture and sharing easy and secure. 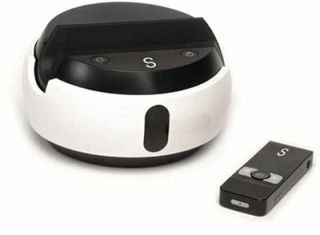 The wireless, rechargeable Swivl Robot holds a mobile device (tablet or phone) to capture video and/or present slides. The robot utilizes your mobile device’s camera, microphone, and Bluetooth connection to capture lessons and deliver them wirelessly to the Swivl Cloud, where they can be managed and shared privately or with designated groups. Ease of Use: The Swivl Robot, Cloud service, and free Swivl Capture app (iOS and Android) are very easy to set up and use. Once charged, you simply slide your mobile device into the cradle (adapters for different-sized devices are included) and connect the supplied audio cable to the ports in the robot and your device’s headphone jack. Remove the marker from its storage/charging compartment, turn it on, pair via Bluetooth, and you’re ready to start. The marker enables the robot to follow the instructor, start/stop the recording, capture audio, and control the slide presentation. You can hold the marker in your hand or hang it from your neck with the supplied lanyard. The robotic base can be mounted on a tripod and can also be used with a digital SLR camera with an optional mount (sold separately). The settings menu of the app gives you the ability to control the size of each video and to set the recording time. You can enable the automatic tilt feature so the robot will follow when you kneel down or hand the marker to someone who is in a lower position than you, such as at a desk. You can also see the battery status of both the base and the marker. Creative Use of Technology: The Swivl Robot combined with the Swivl Cloud platform and app constitutes a very innovative use of robotic technology that allows instructors to capture lessons for review or flip the classroom. It only takes a few minutes to get it up and running. Suitability for Use in a School Environment: The Swivl is suitable for school environments from elementary to higher ed. The free Swivl Cloud account limits you to 20 viewers per video and 200 minutes of footage. So, if you are going to use this with a larger audience, or want to store a lot of video, it’s best to budget for the basic or pro accounts. Discounts are available for yearly subscriptions and for institutions and groups. • Easy to set up and use out of the box. • Can combine both video and slide presentations and share in the cloud. • Gives the instructor the freedom to move around the room while presenting. OVERALL RATING: The Swivl Robot, Cloud and Capture app combines for a powerful suite of tools ideal for flipping the classroom, lesson capture, and professional development.